Audience: This course is for Armed Professionals and LEO’s only. It is designed to help students improve skills that are needed when responding to a single man call outs or when back-up is still not there. Students will learn problem solving techniques before it is all on the line and you are having to figure it out for the first time. 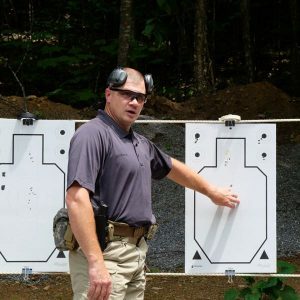 This is a 3 day (28 hour) course that is designed to challenge your thought process and increase your pistol handling abilities. Scope: The focus of this course is to introduce and refine new skills in high threat situations to give students an understanding of how to formulate possible solutions and build skill sets before they are needed. There is a four hour hemostatic control portion of this course that is very hands on including wound packing, tourniquet application and causality evacuation, plus much more. These are 8 hour plus training days 8:30 am to 4:30 pm (or longer) with 30 minutes for lunch. It is highly recommended that you bring your lunch as you will have no options within 15 mins of the range. It is also recommended you have snacks, some will be available such as power bars and granola bars. Otherwise, please bring your own. Length & Price: 3 day. $510.